A cross stitch/needlepoint charted pattern inspired by You've Got Mail (2001 Warner Bros Studios). 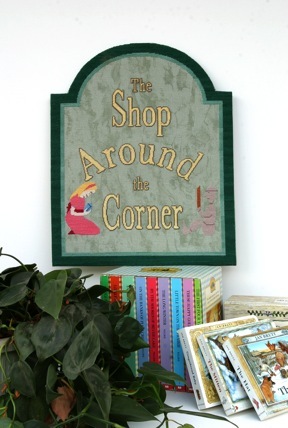 If you are a fan of the original Shop Around the Corner (1940 MGM Studios) starring James Stewart, or the remake, In the Good Old Summertime (1949 MGM Studios) starring Judy Garland, or the most recent remake starring Tom Hanks and Meg Ryan, you'll want your own memento propped up on your piano! Don't worry about finding a frame - it's stitched in as part of the design! Kit includes Pattern, ample Presencia Finca perle cotton and Zweigart Vintage Mono Deluxe canvas to complete one 14 x 17" wall hanging. It is an open-weave project; that is, the background is not intended to be stitched.